Federal Holidays 2014 will have the details of all the federal holidays declared by the US government. Federal holidays are public holidays declared by the United States Congress for the federal employees. These federal holidays are according to the Federal law (5 United States Code 6103). 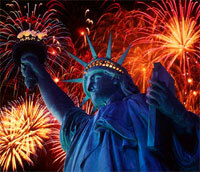 Federal Holidays 2014 will have the details of the 10 federal holidays that the US government recognises as Federal holidays. In addition to these 10 federal holidays there is one more holiday, which is the Inauguration Day celebrated on the 4th of January, every 4th year. There are many things related to these federal holidays, which will all be explained in this Federal Holidays 2014 Calendar. We should note that federal holidays are for those federal employees who work on a Monday to Friday work cycle. So, if a holiday falls on a non working day, i.e. Saturday, then the holiday is observed on the preceding Friday & if it falls on a Sunday, then it's observed on the following Monday. Most federal holidays are also observed as state holidays, although there are no National holidays in the USA, as Congress government has the authority to declare holidays only for Federal institutions. More often these Federal holidays are referred to as Public Holidays or Legal Holidays. Bank Holidays are the same as Federal holidays as they also follow the Federal Holidays 2014 Calendar. In addition to the 10 Federal holidays declared by the US government, Inauguration Day is also celebrated as the 11th holiday. This holiday is observed once every four years following US presidential election. This holiday is mainly observed by the government employees in the Washington DC, Maryland and Virginia. The observance of Inauguration Day started as a means of relieving the congestion caused in the Washington DC during the swearing in of the President and Vice President of United States of America. Federal Holidays 2014 Calendar has provided you with details of all the Federal holidays that has been approved by the government of United States of America. Another important information attached with the observance of Inauguration Day is that if you are working in the Washington DC even though your job post is someplace else, you are entitled for the holiday. On the other hand, if you are a person whose job post is in Washington DC but are on travel elsewhere, then you will not be entitled for the holiday. Hope all the information given in our Federal Holidays 2014 Calendar is of use to you. With this, we wish one and all a happy 2014!